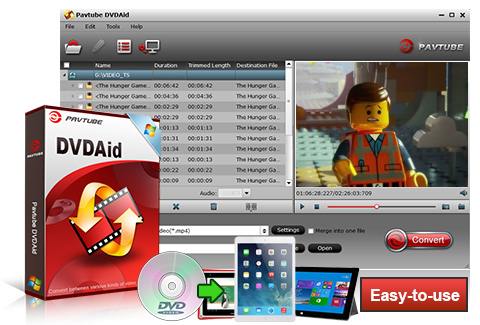 Pavtube DVDAid is a professional DVD ripping and converting program with strong ability to remove DVD protection, transcode DVD to any video and audio format, and edit DVD to create personal movie. With it, you can free your DVD files from the disc and start enjoying your favorite movies anywhere including iPad, iPhone, iPod, Google Nexus tablet, Amazon Kindle Fire (HDX), BARNES&NOBLE NOOK HD+ Tablet, Galaxy Tab Pro, Galaxy Note 10.1 2014, YouTube, Facebook and more! Moreover, it can makes 1:1 copy of original DVD Disc without quality loss. For the short time it takes to convert the movie with the help of CUDA/AMD GPU acceleration, and you will get hours of enjoyments. It’s simple to use and well worth the investment. With more than 200 video and audio types listed as output format, you can convert DVDs to popular media players like iPad, PSP, PS3, Apple TV, Zune, Xbox 360, Android phones, etc. After loading your DVD, you can freely set preferred audio track and subtitles for better movie enjoyment. You could adjust video codec, video display ratio, bitrate, frame rate and more presets to get great DVD experience with best settings. Directly copy DVD movie content without extras to save time and storage space. With NVIDIA’s GPU or AMD’s CPU, you can get six-times-faster conversion with higher quality. Easily merge several DVD videos into one clip to enjoy movies with natural transition. With built-in player, you can preview the settled-down DVD video to make sure the adjustment and take screenshots as will. Even though my DVD is copy protected by region code, CSS, Pavtube DVDAid can efficiently load DVD information and finish DVD ripping as I like. I'm a a tech holic who is keen to sharing all kinds of interesting and useful things about multimedia, internet, and technology, etc.